At TerraCORE Panels, our reinforced lightweight stone panels are the solution to the Elevator industry’s dimensional stone design problems. 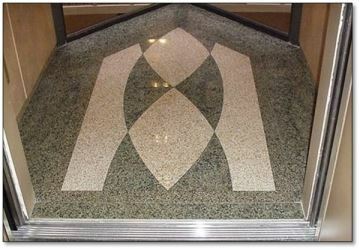 Our custom designed panels can be manufactured using granite, marble, limestone, travertine, onyx, and sandstone. Likewise, a multitude of finishes, such as polished, honed, flamed, bush hammered, sandblasted, antiqued, or acid washing can be incorporated into your elevator design. As an added feature, we can inlay mosaics, plaques, wood, metal, or even water jet etch a custom-made, beautiful design into your stone veneer panels. Building owners have all experienced high maintenance costs and the deterioration of cheap elevator cladding when renovating elevator cabs. Our panels are extremely durable, and resist up to 60 times more impact than solid 2 cm dimensional stone. They easily withstand the day-to-day impacts, dings, dents, and abuses common in most elevator traffic. These panels can also be sealed to withstand oil and water penetration. As a result, our stone veneer panels have a low life-cycle cost and are virtually maintenance free. These natural stone panels offer elegance, beauty, and durability for elevator cab walls, ceilings, and floors. There are multiple reasons why our panels are selected for elevator cab modernization. If you’ve been looking for a new image that has a natural stone facing, look no further than TerraCORE Panels for your immediate and future needs. If you are interested in our stone veneer panels for your elevators, call us at (214) 749-0999 today to begin.